Doug Barry is a Senior International Trade Specialist in the Trade Information Center, part of the U.S. and Foreign Commercial Service. Founder and CEO of Ambient Technologies Carlos Lemos was in Washington, D.C. recently to receive the Presidential “E” Award for excellence in exporting. Lemos earned the award for taking his 55-employee company global with help from the Export Assistance Center in Clearwater, Florida and other programs of the Department of Commerce. Senior Trade Specialist Doug Barry of the Trade Information Center talked to Lemos after the White House Ceremony. Barry: Can you tell us a little bit about the history of your company–which I see means environment in Spanish–when it started and what you provide? Lemos: We started our business in 1993. I worked for a very large consulting firm for 22 years. And then I decided to take my Brazilian heritage and live the American dream, which is running your own business. 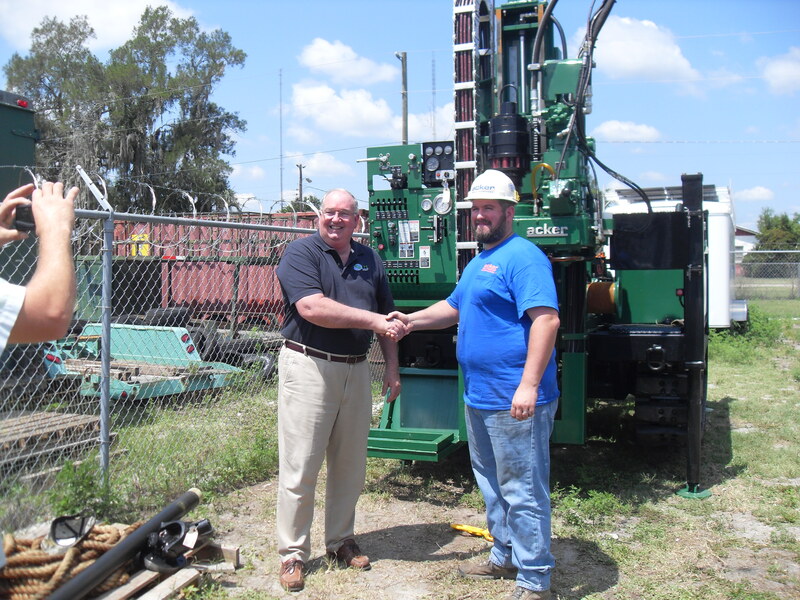 So I started my own company, and I do geology, geophysics, drilling services. We support companies that are looking to find information that’s below the ground, whether it’s groundwater-related, construction or engineering including mining. Barry: Can you tell us about the main challenge that you faced to enter the international marketplace? CEO of Ambient Technologies Carlos Lemos (left) helping to drill a new Panama canal. Lemos: Well, the challenges are really enormous when you’re thinking as a small business. My first attempt to export was going to my native country. I speak Portuguese and was born in Brazil. I felt comfortable there. But Brazil was so big and it’s so challenging and it’s so competitive that it didn’t work out that well. It was great to reunite with family but it wasn’t very good for business. So I decided to pursue opportunities in countries that weren’t quite so large and where people are comfortable working with smaller companies. So we started looking at countries in Central America. I went to these countries and was successful there because of trade missions organized by the U.S. Department of Commerce. Barry: Was your domestic business tanking in 2008? Lemos: Truly speaking, in 2008, when everything kind of collapsed, I looked at all my rigs parked and I said, what am I going to do with this? It became a matter of necessity as much as just a whim. And then by that time I had gone overseas to look at the opportunities, saw Panama as an opportunity and I saw other countries at that time that were looking at doing some other projects. And I said, “We have to look at an international way to survive.” And so we took the leap of faith and went over there and took our equipment. And then when the new canal project started, we had the equipment there and many people didn’t. We were the first American company to work with the consortium that’s building the canal. Barry: And how did that happen? What kind of introductions were made to enable you to compete for that work? Lemos: What we did is through the Department of Commerce. I was able to meet, number one, very important, was the canal authority – the ACP. We also received introductions to the local engineering community. They said, “We welcome you because we’re going to have more work than we can handle. So yeah, come on down and work with us.” And they are very pro-American in Panama. And they were very glad for us to have gone there. Barry: What part of your annual revenue comes from your international activities? Lemos: Right now we are about 25 percent, and it’s growing. We’re being asked to go to Colombia, and that could further expand our revenues. So I’m looking for the international business to grow. And I wouldn’t be surprised if in the next few years, it grows to 50 percent. Another benefit is that bigger U.S. companies are asking us to do international work for them. We’re willing to deal with the headaches of dealing with customs. We’re willing to deal with the inconveniences of the locals that quite frequently are not that bad. But that’s okay; the big companies can think that. It gives me more business. So we take advantage of that. We do things that nobody wants to do. Barry: What sort of challenges do you face in scaling up to be able to serve this growing market? Lemos: Well, being small is not easy. It’s difficult to get financing for a drill rig to take it overseas. If you go through a conventional bank, they don’t like to see their assets outside the country. It doesn’t make any difference that I’ve just won a $2 million contract. With this new business we’re hoping to qualify for government loan guarantees that can help us do that sort of thing. Another challenge is finding bilingual technical people: people that have a degree in science, engineering, that are also bilingual and willing to go overseas for periods of time. Barry: What are the other benefits of selling international besides staying in business and thriving in business? What are the other gains from doing business outside your own country and culture? Lemos: Well, it is the human factor of it all. It’s the reward that you have by interacting with other cultures. It’s the reward that you get to see that your employees are seeing beyond what’s right here in front of their eyes, that they actually see now the world in a more global view than just right here. Barry: Is Ambient a better company because of its exporting? Lemos: By far it’s a better company. Lemos: I believe that the employees are proud that we are a global business than when we were just a local business. There’s something about it that makes them more enthusiastic. And therefore, you know, the employees are the company. You have to find the right people who are interested in other cultures. I may hire a biologist to do a job that involves geology. Because of their attitude and their ability to deal with other cultures and deal with other people, they’re by far a better employee. I love to see when the guys mature into a role of mini-ambassadors. Barry: I think I’m ready to work for you immediately. Seriously, what would be your advice to U.S. companies that aren’t exporting now or only dabbling in it? Lemos: I really believe that one of the things they should do is really get involved with the local Export Assistance Centers of the U.S. Department of Commerce because that’s what was successful for me. Also be prepared that there is a cost in getting started that is not going to be immediate gratification. Trying to go in put a little money and trying to get big rewards very quickly doesn’t work.